On this Creditanstalt Day, the battle over the Euro has been joined! The Euro was getting crushed in after-hours trading last night, pushed down towards $1.26. The shorts are wolfpacking it. 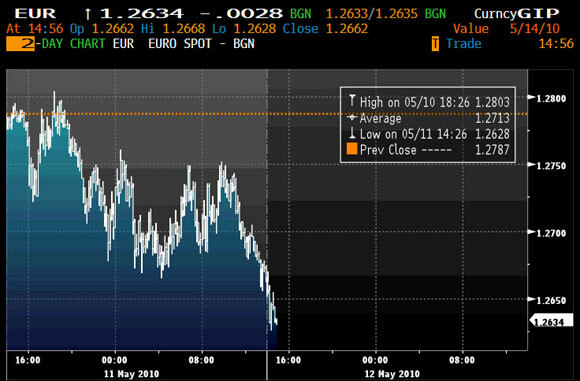 This morning central banks rushed in to intervene, and the Euro bounced off $1.261 to run above $1.27, but has fallen off again. It remains well below the “we’re saved!” peak of this weekend, at $1.31. If the ECB cannot withstand this assault, the Euro-TARP bailout is doomed. The intervention caused a 20-pt reversal flip in the S&P futures, which had been falling towards 1140. What the wolves see is simple logic: the PIIGS are insolvent. Their income cannot cover their current debt. Piling more debt on top only prolongs the problem. The Euro-TARP tries to lower borrowing rates, but if the assault on the Euro drives rates up, the ECB is left with QE to self-finance the debt, which it wants to avoid. Hence something will break. Right now the spreads are widening for LIBOR vs. overnight index swaps (OIS), as they did in 2007, when they ran from 13 bp to 73 bp, and then “the rout was on.” Last week the spread jumped from 9 to 18 bp, and since the Euro-TARP was announced, have widened to 20 bp. Bondsquawk also notes that 2-yr rate swaps have also widened. 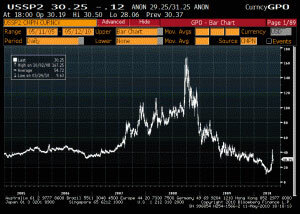 The TED spread (Treasuries vs Eurodollars, now called LIBOR) for 3-monthers is back to levels of 3Q09. John Taylor (Stanford Prof and originator of the Taylor Rule for Fed interest rates) writes today in the FT that what may ultimately break is confidence in the ECB, and with it confidence in central banks.